A small black-and-white cat, one of a family of strays living in the Brooklyn Greenway construction site, has given birth to a litter of kittens within the site. COLUMBIA WATERFRONT DISTRICT — After Marcia Salovitz learned that a litter of kittens were born in the Brooklyn Greenway construction site on Columbia Street, the Carroll Gardens resident decided to take matters into her own hands and find them good homes. 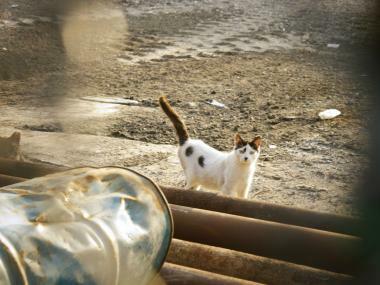 Salovitz learned the news from Eshete Woldeyilma, a former resident of Columbia Street and Ethiopian refugee who has dedicated the past 15 years to feeding and protecting feral cats at the construction site. She said she has run past Woldeyilma several times during her jogs along the greenway. A couple of weeks ago, she stopped and spoke with him and learned that the cat he calls Rocket, a small black-and-white feline, had given birth to a litter of kittens within the fenced area of the construction site. Salovitz, a 43-year-old human services worker who has lived in the neighborhood for about eight years, said she has a soft spot for the strays in the neighborhood and is set on finding good homes for the new kittens. “I have reached out to a whole bunch of organizations, including Kitty Kind in the PetSmart in Union Square, where I adopted my own cat,” Salovitz said. “The goal would be, ideally — God knowing the kittens are OK— to get the mom and the kittens, and keep them together. If this particular colony of feral cats is registered with the NYC Feral Cat Initiative or the Mayor’s Alliance for NYC Animals, Woldeyilma could be getting funded to feed the cats instead of using his own money on them, Solovitz explained. Currently, she is searching for an organization to help her trap and neuter/spay the kittens, as well as the mother. After that, she said she is willing to keep the kittens in her home until suitable homes can be found for them. Solovitz has yet to hear back from an organization that is willing to help her with her cause, but she said she wouldn't mind trapping them herself with a little help and the right equipment. This isn’t the first time Solovitz has helped the strays in her neighborhood. She noted that all three of her own cats are either from a shelter or have been rescued. About two years ago, Solovitz rescued a five-pound kitten that was caught in the wheel well of a truck. Once she was able to free the cat, she said she took her to a vet, cleaned her up — and she’s been living with Solovitz ever since.